OK 9A Across Salt Creek, Seminole County. 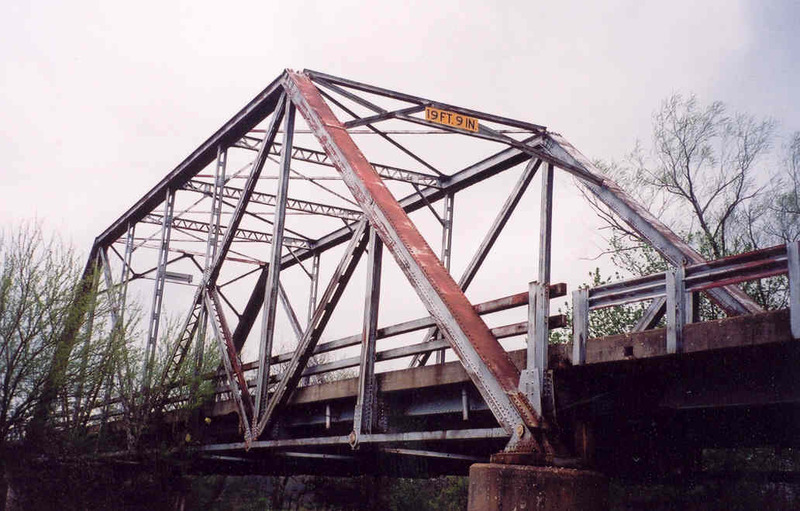 Oklahoma's oldest documented truss bridge. built 1896 by The King Bridge Co, Cleveland, Ohio. 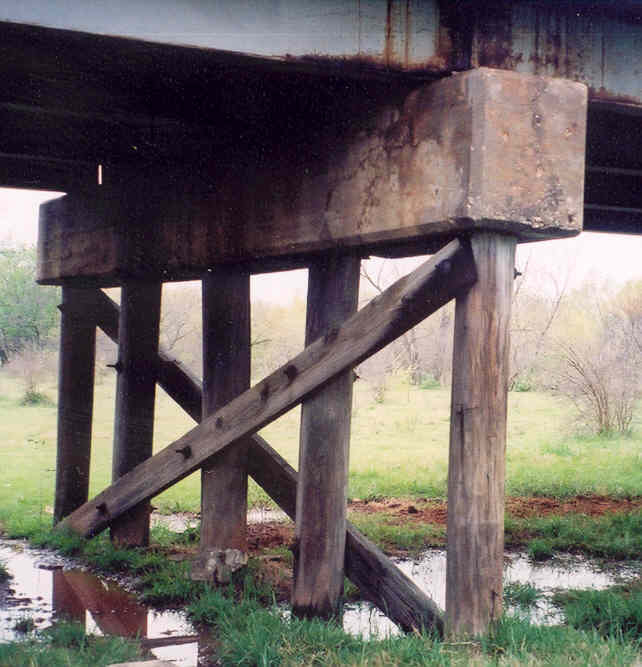 This structure is Oklahoma's oldest documented truss bridge, and may be the oldest bridge period. 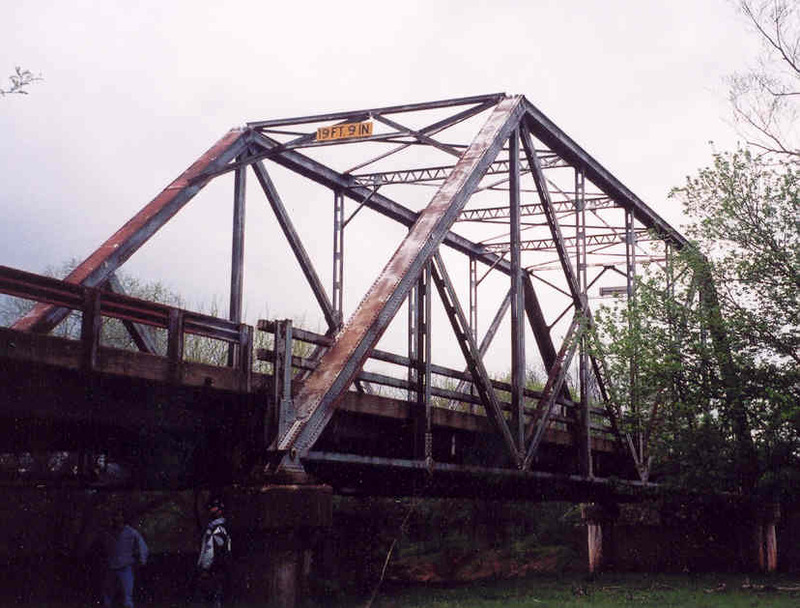 The bridge was built in 1896 as a railroad bridge, and in 1947 it was put into service at this location in Seminole County south of Maud. I do not know what the bridge's original location was (but it supposedly was in Oklahoma), or if the bridge was there the whole time from 1896 to 1947. The broken half of the plaque at the left was found at the bottom of the northeast endpost and was photographed before we rescued it. A paint scar revealed the location of this plaque on the endpost. 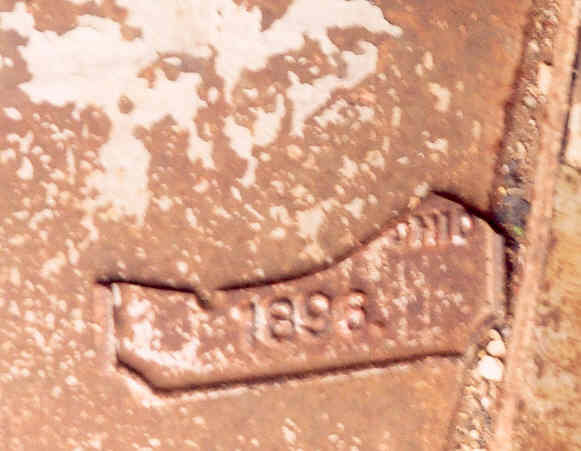 Clearly visible on the plaque are the words "OHIO" and the year "1896"
Our group of bridge hunters will present the plaque as well as copies of the photographs taken on the day we visited to one of two possible state offices in June 2004. Either the state historical society or state department of transportation will be given the plaque and documentation. Above, a side view o f this historic structure. 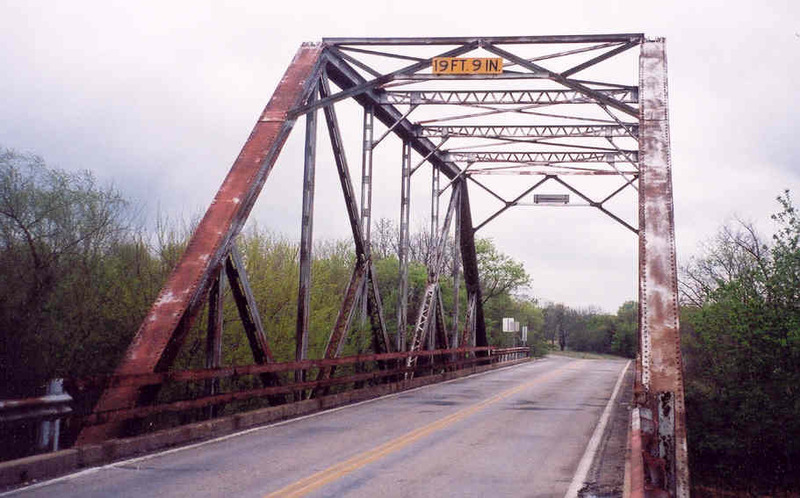 This bridge is a pin-connected sub-divided Warren through truss, the only one of its kind in the state. 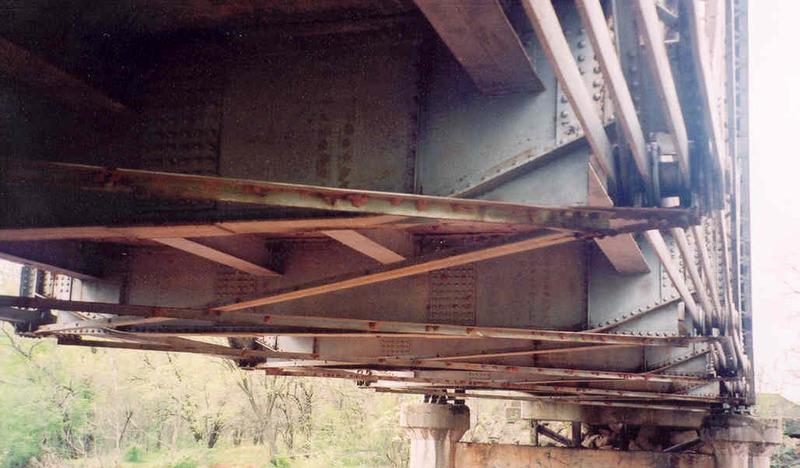 Below, evidence of the widening of this bridge is clearly visible under the deck. The holes on the blue box are the original rivet holes used to attach the deck stringers to the heavy floor beams. When this bridge was widened, the floor beams were cut in half and an extra length of built-up section inserted between the halves. 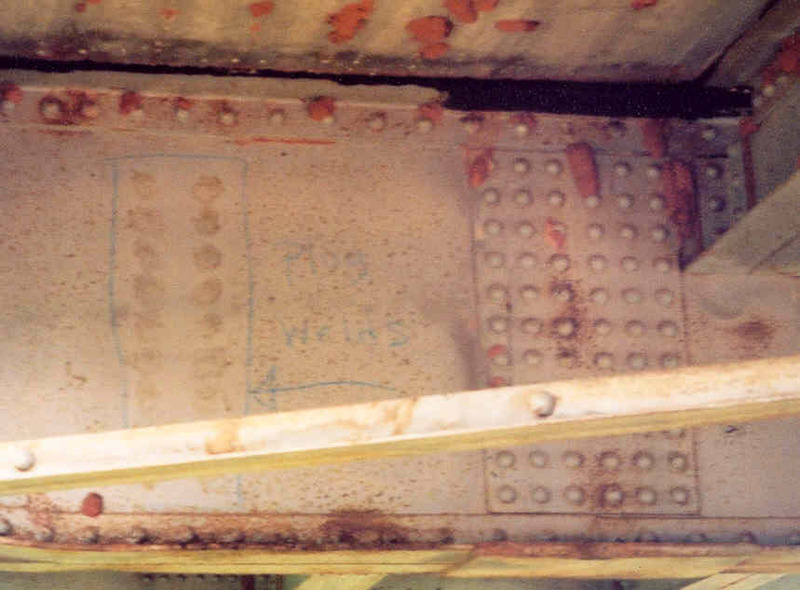 The splice plate with all the rivets to the right of the blue handwriting is the splice between the original beam and the added section. Note also the plate welded to the bottom angle flange. Below, a general view of the bridge's underside. Above, part of our bridge hunting crew, Ken Parker and Kyle Wright, examine the approach spans. The column between the two spans of the south approach seen here are wooden piles, muck like you would see under a railroad trestle. The north approach span is constructed in an identical manner. Below, a close up of the wooden pile-pier. The spans over this pier are not continuous. Below, another side view from below the bridge.